Great to hear Wayne at Smiths with Brendan and Mark. Wayne's our own driving, informed pianist. I remember first hearing him in a room at the Canberra Theatre back in the '80s and the memory remains. We lost him for a time to various venues and casinos in China, but he's been back for several years and playing the storm we know. There's intensity in Wayne's playing, informed, varied, modern with a blues influence, and that intensity and drive that comes with such ease and a good ear and informed listening. He was with that great rhythm section that's getting such a workout recently, both also Canberra products from pretty much the same era. Mark has been around town mostly over the years, but Brendan was lost to Sydney for 18 years but now returned. So, a blessed trio. They played a few Wayne originals, the mesmeric and mallet-drum-fenced King of Kings and the homage to his great piano influence, Mr Hank Jones. The others were common enough, but brought to life with some stunning solos all round and a deep understanding between the participants: Four, Monk Think of one, Cedar Walton Clockwise, In your own sweet way. Also two from Bird, Relaxing at the Camarillo and Yardbird suite. And my fave, Alone together, introduced with a solo bass extravaganza. And Wayne playing solo piano for Ellington prelude to a kiss. Some great tunes with a few originals. These three are local stars and the audience obviously holds them close, too, chatting back and forth from stage and whooping with amiable intimacy. Another vision of NYC coming to Canberra. 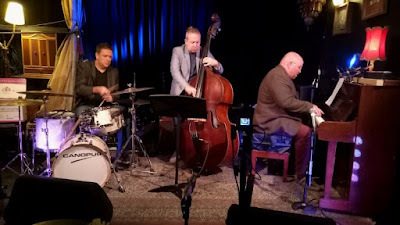 Wayne Kelly (piano) performed with Brendan Clarke (bass) and Mark Sutton (drums) at Smiths.